Boat Elan Impression 50 called Alboran Mai-Tai (Radazul) has been built in 2015. We propose this sailboat from harbor Radazul in area of Tenerife. Alboran Mai-Tai (Radazul) is registered for 10 passengers. Layout of the yacht is 10. Elan Impression 50 Alboran Mai-Tai (Radazul) has 5 bedrooms. For comfort of passengers there are 2 toilettes. You can fill the fuel tank with 295.00 l liters and in water container it goes even 605.00 l liters. With engine 75 hp Alboran Mai-Tai (Radazul) can sail really fast. Alboran Mai-Tai (Radazul) is 15.20 meters long and 4.68 meters wide. Draft is 2.23 m. Use our website to find other vessels right here: Yacht charter Radazul. Boat's equipment involves : Autopilot, Gps plotter, Bimini top, Dinghy, Anchor electric windlass, Bow thruster, Radio / cd player. . Security deposit is at the level of 2500.00 EUR. Choose our offer and enjoy your holidays on the deck of Alboran Mai-Tai (Radazul). 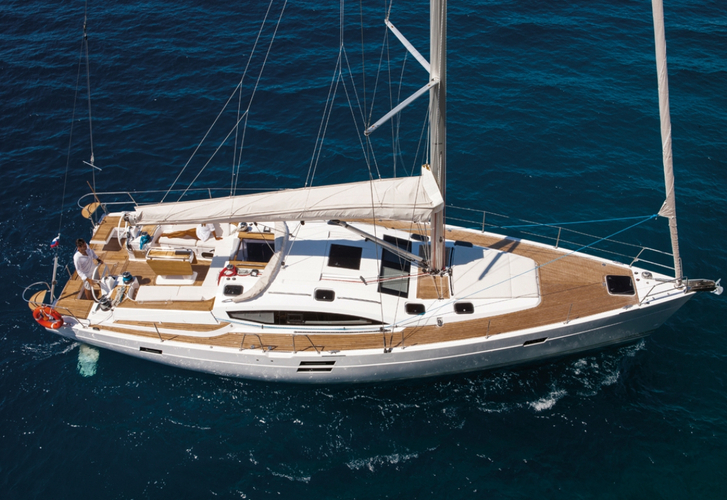 This Elan Impression 50 from Radazul from Canary Islands Look for in this site: Yacht charter Canary Islands. Elan Impression 50 CUPCAKE - Air condition, NEW!